I’m taking part in a month long Post-it Note Poetry exercise (#PINP19) on Instagram over February (organised by @Soullyrical). I’m taking part because too often I’m a bystander. Also, after all this time, I know inspiration works better with restraints, and a bunch of discipline, rather than the panic that infinite space induces. A Post-it note is still a blank page, but the medium reduces the stress so I can let go of self censorship. Contributors are free to write bad poetry, ill fitting rhyme, free verse, or anything. It doesn’t matter because it’s ephemeral. It’s about taking a few moments each day with the intention to be focused on this tiny poetic thing…whatever poetry means. The benefits for me include getting to complete poems, while getting to read a lot of other contributions. Plus, there are oodles of positive encouragement and a community. I could do with both right now. Meanwhile, academic types and traditional publishing gatekeepers question the quality and point of such endeavours. Is ‘social media poetry’ a trend? Who are the audiences? What’s it for? Is it confined to a response to failings in representation in mainstream publication routes? I’m leaving analysis to others. I just want to be a part of something in an effort to recapture a little scrap of the joy found in messing about with words because…well, let’s say joy has been in short supply over the last few months. What else? Perhaps this is also about staking out spaces and identities. I’ve never particularly considered myself a “Poet”. The people I’ve met who’ve called themselves poets are either intimidatingly driven and erudite, or a touch too outlandish, or a combination of both. Especially performance poets. They can be talented, kind people, but I am not them. Needless to say, I have written poetry ever since whenever I decided to write fiction, but taking on the label of poet seemed much more serious than calling myself a writer. While I occasionally send poems to serious publications and competitions, I’ve not won anything nor had a poem published since high school. Perhaps, until then, I’m not a poet? Perhaps it’s always up to others to decide? It’s one thing to quell inner critics, but the world is full of them. Which brings me to a recent letter to the editor, criticising the winner of The Victorian Prize for Literature, and the Prize for Non-Fiction: No Friend But the Mountains: Writing from Manus Prison by Behrouz Boochani. The letter writer claimed the book circumvented guidelines, thus discriminating against entrants such as herself. 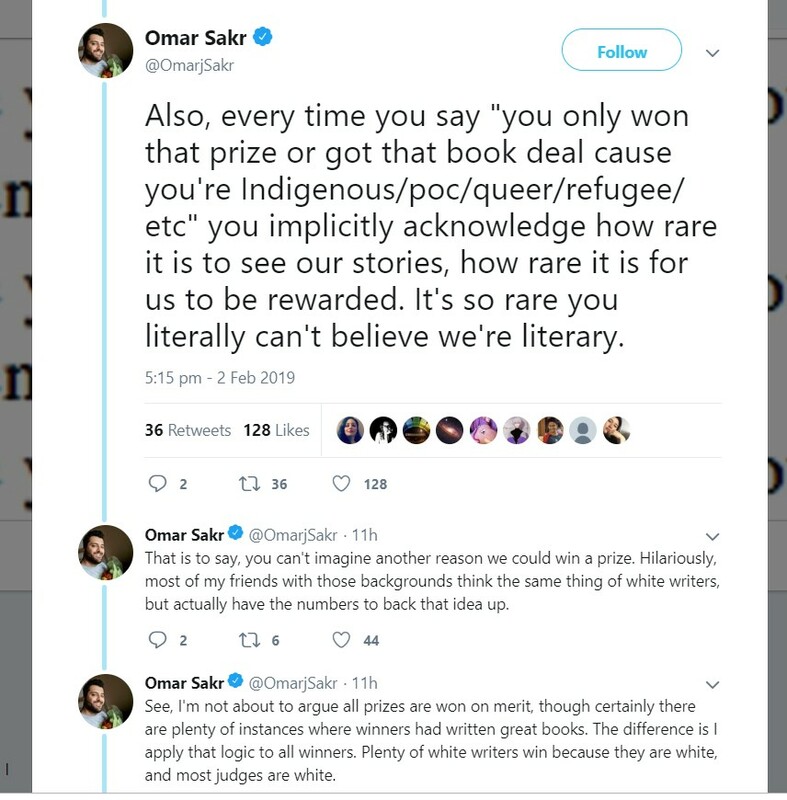 To be clear, I think Behrouz Boochani is a deserving winner and his work is important, and I think the letter writer’s arguments are as specious and as racist as Omar Sakr argued on Twitter. The social media response to the letter interested me, as many presented the same argument: since she has never won, then her work is sh*t. The only thing I bring to this, is, thousands enter competitions or send their manuscripts out, and few win or get published. While I’m realising there is space for everyone to create, not all writers will win prizes or see works succeed. Maybe her letter is a ‘tell’ about how her work is crap. Or maybe the work is just ok, or the wrong style, or entered into the wrong competition for the wrong audience. The letter writer expressed a prejudiced and narrow minded opinion; maybe this reflects her creative writing, maybe it doesn’t. And yes, it is a small-minded to begrudge Behrouz his win, especially in the circumstances imposed upon him. His book is a miracle of tenacity. Then, I consider myself and my writing. I’ve railed at the universe that seemed set against me no matter how hard I worked to write something worthy or important or just good. But I never want to be the kind of writer who begrudges the success of others. Bitterness poisons everything, including the writing. I don’t want to be bitter, when writing began in wonder and for the joy of patterns and making something beautiful out of nothing at all but the words in my mind. And yes, while a win or a paid publication would help pay bills, despair doesn’t.